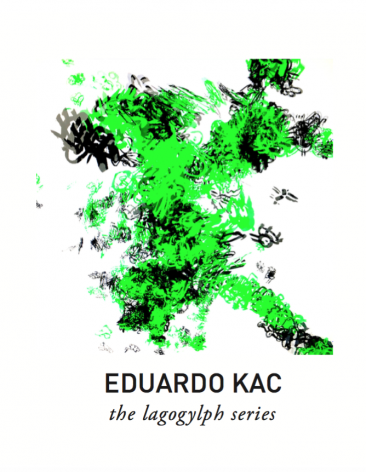 Geary Contemporary is pleased to present the New York premiere of Eduardo Kac’s The Lagoglyph Series, a suite of works in which the artist explores a personal pictographic language. The Exhibition will be on view from January 7th to March 5th with an opening reception Thursday, January 7th from 6 to 8 p.m.
For the last thirty years, Kac has pioneered new art forms such as digital art, telepresence, and bio art—including the globally celebrated artwork GFP Bunny. "We are witnessing the emergence of a new type of artist, the artist/scientist/researcher," Christiane Paul, curator at the Whitney Museum of American Art, told NY Arts Magazine. "Eduardo Kac is a perfect example." In development since 2006, the Lagolyphs echo the playfulness of the rabbit that inspires their form; they suggest meaning while escaping our grasp. Described as leporimorphic or rabbitographic, the Lagolyphs eschew characters and phonetic symbols in favor of a crytpolanguage that multiplies (as rabbits are wont to do) possible meanings. Kac’s video works use this sense of multiplication as an allegory for the proliferation of new narratives in the 21st century—As the New York Times observed in a review of Kac’s work, “Now that we've picked up the code, we've begun our own translations.” Kac states that Lagoglyph Animation “…is different from traditional animations in that it does not have a beginning or an end: it evolves continuously and never repeats itself. It doesn't loop.” The work was exhibited at the Havana Biennial earlier this summer. Eduardo Kac (pronounced “Katz”) lives and works in Chicago. He has exhibited internationally at venues that include Whitechapel Gallery, London; Maison Européenne de la Photographie, Paris; Castello di Rivoli, Turin, Italy; Mori Art Museum, Tokyo; Reina Sofia Museum, Madrid; and Seoul Museum of Art, Korea.